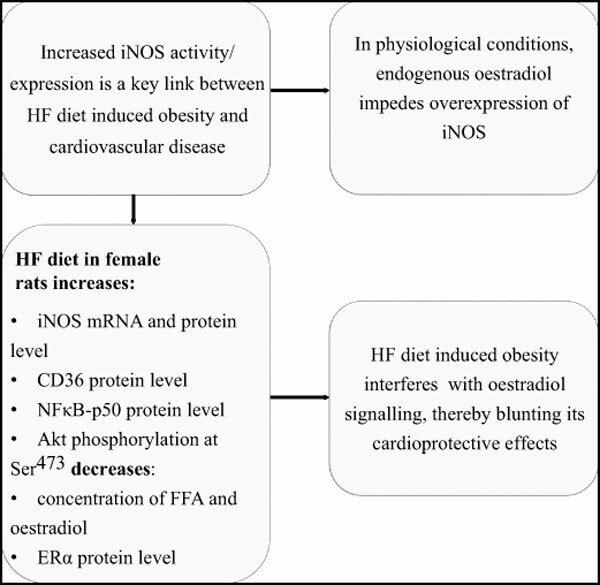 Background: Overexpression of inducible nitric oxide synthase (iNOS) is a key link between high-fat (HF) diet induced obesity and cardiovascular disease. Oestradiol has cardioprotective effects that may be mediated through reduction of iNOS activity/expression. Methods: In the present study, female Wistar rats were fed a standard diet or a HF diet (42% fat) for 10 weeks. iNOS gene and protein expressions were measured in heart tissue. HF-fed rats exhibited a significant increase in cardiac iNOS mRNA by 695% (p<0.05), iNOS protein level by 248% (p<0.01), without changes in nitrate/nitrite levels. Expression of CD36 protein in plasma membranes was increased by 37% (p<0.05), while the concentration of free fatty acids (FFA) was reduced by 25% (p<0.01) in HF-fed rats. Expression of the p50 subunit of nuclear factor-κB (NFκB-p50) in heart was increased by 77% (p<0.01) in HF-fed rats. Expression of protein kinase B (Akt) and extracellular signalregulated kinases 1/2 (ERK1/2) were unchanged between the groups. There was a significant increase in the ratio of phospho-Akt/total Akt but not for phospho-ERK1/2/total ERK1/2 in HF-fed rats. Estrogen receptor-α levels (by 50%; p<0.05) and serum oestradiol concentrations (by 35%; p<0.05) were shown to be significantly reduced in HF-fed rats. Results and Conclusion: Our results revealed that a HF diet led to increased iNOS expression, most likely via a mechanism involving Akt and NFκB-p50 proteins. Decreased levels of oestradiol and ERα protein in the HF-fed group, in combination with increased iNOS levels are consistent with the hypothesis that oestradiol has a cardioprotective effect through its ability to regulate iNOS expression. Keywords: Cardioprotection, cardiovascular disease, oestradiol, inducible nitric oxide synthase, insulin resistance, obesity. Keywords:Cardioprotection, cardiovascular disease, oestradiol, inducible nitric oxide synthase, insulin resistance, obesity. Abstract:Background: Overexpression of inducible nitric oxide synthase (iNOS) is a key link between high-fat (HF) diet induced obesity and cardiovascular disease. Oestradiol has cardioprotective effects that may be mediated through reduction of iNOS activity/expression.